After 3 years DIABLO has been reborn, with a new and improved formula for even more fat loss performance. DIABLO is designed to enhance the release of fat from stubborn fat storage cells and assist in the metabolism of free fatty acids, to convert stored fat into energy. 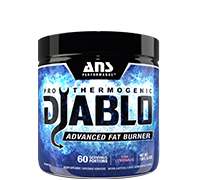 Utilizing 6 different mechanism of action, DIABLO synergistically targets stubborn visceral and subcutaneous fat with ingredients that increase fat breakdown and elevate fat utilization for energy via thermogenesis. You can literally feel your body-heat rising as it targets and destroys stubborn fat. Don’t let fat hold your physique hostage, it’s time to kick the hell out of fat, and destroy it with DIABLO. L-Carnitine: Responsible for the transport of fats into the cells to be used for energy in the body. By raising muscle carnitine levels, you support the fat burning process, and as the body becomes more efficient at processing fuel, it will increase energy levels. Elevating carnitine will also improve physical performance by burning more fat, sparing glycogen, clearing muscle lactate, and increasing anabolic hormone response. N-Acetyl-L-Tyrosine: The highly soluble form of the amino acid L-Tyrosine, and an important precursor in the production of epinephrine, dopamine and norepinephrine. These hormones contribute to elevated energy, mood and mental alertness. Choline Bitartrate: The combination of caffeine, carnitine and choline supplementation can decrease body fat and serum leptin concentration, and also increases fat utilization for energy. Leptin is a protein hormone that regulates energy intake and expenditure, including appetite and hunger, metabolism and behavior. Choline plays a role in the oxidation of fatty acids, carrying them out of the liver and to the mitochondria of skeletal muscle cells and other metabolically active tissue. Green Coffee Bean: The chlorogenic acid found in unroasted green coffee beans has been shown to inhibit an enzyme, glucose-6-phosphatase, an enzyme involved in the release of sugar for energy use. By inhibiting the availability of glucose for energy, the body then is forced to turn to alternate sources of fuel, namely fats. The end result is safe and effective weight loss and a change in body composition by tricking your body into preferentially using fat as fuel. ADILASE™: An exclusive specialized extract of Hemerocallis fulva, designed to maximize the release of fat from stubborn cells. ADILASE™ helps stimulate fat cells to release fat into the bloodstream. Many people struggle to lose fat with 'typical' high-stimulant fat burners due to a condition called lipolytic catecholamine resistance, which means that their fat cells do not readily release fat when stimulated to do so. When ADILASE™, is combined with caffeine, it improves the lipolytic (fat releasing) sensitivity in low-responding fat storage cells, indicating that the lipolysis-promoting activity of this combination may be beneficial for improving body fat metabolism. Caffeine Anhydrous: A potent CNS Stimulant, caffeine triggers fat cells to break down and release fat by increasing output of epinephrine. It also increases metabolic rate, improves athletic performance and helps reduce appetite. 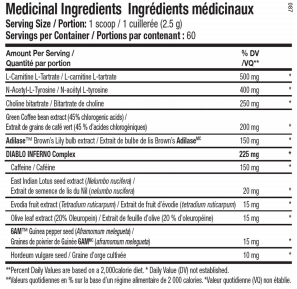 DIABLO contains 150mg of caffeine per scoop. Lotus Seed extract: The East Indian lotus seed is a plentiful source of phytochemicals, including the beta-adrenergic receptor agonist higenamine which shares it's mechanism of action and potential for fat loss with ingredients like synephrine and ephedrine. Evodia fruit extract: The capsaicin-like alkaloid evodiamine is found in Evodia fruit, and it acts as a vanilloid receptor agonist, without the peppery hot taste. Like capsaicin, Evodiamine increases body heat production and raises resting core temperature, increasing the calories and fat that are burned for energy. The stimulant and appetite suppressant effects of evodiamine can be attributed to its effects on catecholamine levels. Evodiamine increases the release of catecholamines such as adrenaline and dopamine from the adrenal glands, increasing energy levels and decreasing appetite. Olive Leaf Extract (std to 20% oleuropein): Olive leaves have been known to possess hypoglycaemic, hypotensive-diuretic and antioxidant properties; as a result olive leaves reduce fat load and circulatory fat levels. In a recent animal study, oleuropein increased noradrenaline and adrenaline secretions, as well as uncoupling protein 1 levels in brown adipose tissue, leading to increased thermogenesis. Additionally Oleuropein is believed to enhance the conversion of the thyroid hormone T4 (thyroxine) into the more potent form T3, which has a 3-5x more active in its roles at augmenting base metabolic rate. 6AM™ – Aframomum melegueta extract: A specialized extract of 'Grains of Paradise', the fat fighting potent seeds from Africa. Clinical trials exploring the weight loss benefits of 6AM™ found that it can significantly increase energy expenditure and loss of brown adipose (fat) tissue. One of the key ingredients involved in the thermogenic response is 6-paradol, a pungent aromatic ketone also found in ginger. Hordeum vulgare seed extract: A natural source of hordenine, this alkaloid is known to be as a central nervous stimulant that helps to aid in the effects of weight loss. It assists in the release of fat cells for energy and helps the process of slowing down food digestion, which in turn can make you feel fuller longer. Directions For DIABLO: Shake container well before opening. Begin with 1 scoop mixed with 4-6 oz of water on an empty stomach 15-30 minutes before breakfast for the first 2 days to assess tolerance. An additional 1 scoop may be taken 5-6 hours later. Once the above steps have been taken, 1 additional scoop may be added to the morning serving (mix 2 scoops in 8 oz of water). Do not exceed the initial dose schedule. Read entire label before use. DO NOT EXCEED 3 SCOOPS IN ANY 24-HOUR PERIOD. Warnings: Not intended for use by persons under 18. Do not use if pregnant or nursing. Consult a medical doctor before use if you have been treated for, or diagnosed with any medical condition, or if you are taking a MAOI (Monoamine Oxidase Inhibitor), or using any prescription or over-the-counter drug(s). This product contains caffeine. Caffeine sensitive individuals may experience the following symptoms including (but not limited to) restlessness, tremors, headache, anxiety, palpitations, increased heart rate, or difficulty sleeping. Do not combine with other sources of caffeine. Discontinue use and call a medical doctor if you experience unusual symptoms. Use only as directed. Do not exceed recommended serving under any circumstances. Do not use if packaging has been tampered with. Store in a cool dry place. KEEP OUT OF REACH OF CHILDREN.